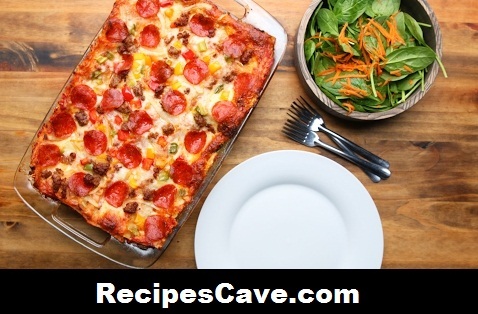 Pizza Lasagna Recipe is another recipe of pizza that you can make at your home. Here is the step by step guideline to make pizza at home. In a 9x13-inch baking dish, begin to assemble the lasagna by spreading a thin layer of sauce on the bottom of the pan. Then, layer ingredients in the following order: noodles, ricotta, sausage, veggies, mozzarella, sauce, noodles, ricotta, pepperoni, basil, mozzarella, sauce, noodles, marinara, mozzarella, veggies, sausage, and pepperoni.